Nowhere near accurate: race and romance! If Lady Kiri Lawford is biracial — Indian and English — why is the model on the cover of Mary Jo Putney’s April release, Nowhere Near Respectable, pretty clearly white? Even in the beautifully edited and scripted book trailer, the actress portraying Kiri is just exotic enough to be, well, anything. Native American, Spanish, Italian, etc. Is there a fear that mainstream romance readers won’t pick it up if she’s a little bit dark? Yes, biracial Indians can absolutely be very pale — and even blonde. I’m not biracial, but I’m “fair,” or “forsha,” as we’d say in Bengali, and frequently mistaken for being Latina. I know several women who don’t “look” Indian but certainly are. I am not trying to question anyone’s legitimacy based on what shade of brown they are (shade-based bigotry is a huge issue in India). But given that romance is a genre where heroines of color are generally relegated to separate imprints or overlooked entirely, is it so bad to want a little more traditional representation? I can’t help it, my nose is a bit out of joint and my skin a bit prickly. It’s too easy to shrug this off as “oh, she’s biracial so she could pass” rather than taking a deeper look at how race, culture and romance converge. By and large, characters with Asian heritage are featured in paranormal romances (thank you Meljean Brook, Marjorie Liu and Nalini Singh!). Apparently being brown is something that fits in naturally with being psychic or a werewolf! In contrast, Asian and Indian characters are a rarity in historical and contemporary romances. Unless we’re speaking of servants and cabbies, or the common “halvsies” trope, which I’ve ruminated on in the past. I’ve also taken on issues of whitewashing — here, here and here, so this isn’t a topic I’m just jumping into now. No, this is a topic that’s very close to my heart. If you’re going to feature a hero or heroine who isn’t white…shouldn’t that be a selling point and something that is really important, rather than just an exotic dash of saffron in a cup of milk? Whether it’s henna tattoos, yoga, or Bollywood dance classes, appropriation of Indian culture in the west is commonplace, but is it too much to ask to have those of us who actually share that culture be represented sensitively and fairly as well? 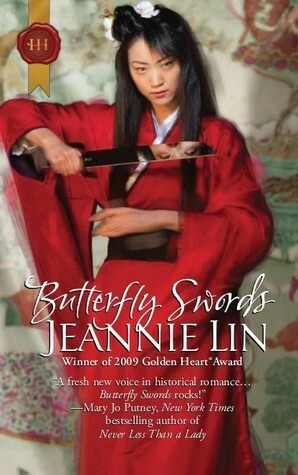 I loved Jeannie Lin’s Butterfly Swords, for taking a real chance with a historical. Why can’t we see more of that kind of fiction, and that kind of representative cover? Can you imagine if a woman with honey brown hair and exposed legs were wielding the titular blades? Yikes! Liz Carlyle’s One Touch of Scandal features a half-Indian hero, Adrian, and he looks it on the cover! I was also pleased that Carlyle’s book had just enough detail to be accurate and flesh out the characters, but not too many factoids that could easily a) be incorrect or b) be offensive. Putney’s books featuring Kiri and her brother Adam are a bit more problematic. On the author’s Web site, Kiri is described as being “half Hindu” and “comfortable with her mixed blood heritage.” Putting aside how hinky that second statement is, you can’t be half of a religious affiliation. She could be half Hindustani, which refers to both the cultural identity and the language, Hindi, but being half-Hindu is up there with being half-Christian or half-Catholic. No such thing! But readers who want to see diversity in fiction do exist. We come in all sizes, all shapes, and all colors. I’ve never put down a book because the heroine didn’t look like me — I would have a pretty paltry TBR pile if that were the case — but I’ll tell you, I would definitely pick up a book if she did. I hear you Mala. I guess it’s okay to have the hero look a little brown (think of all those romances with heroes who are either Native American or half) but things are a little bit dicier on the heroine front since most readers imagine themselves as the heroine. Perhaps the publisher was a little gun shy about putting a heroine with darker skin on the cover. That seems to be a really common occurrence! It’s okay to have the hero be a bit bronzed, but heaven forbid the girl be anything but a pale canvas that the reader can paint herself upon. On Meljean Brook’s cover for Demon Moon, the heroine is paler than she is on the page. Ditto for Kyra Davis’ Sophie Katz books, which I was just made aware of today. But heroes…? I guess it’s okay, since they’re just a fetish object anyhow, right? What’s a little exoticization on top of that? I wondered about the half-Hindu thing too. I thought perhaps it was a common-usage thing for the time & place, but I don’t really know. The thing is, the term was used to describe the book; my beef isn’t even about usage within the text. There’s so much confusion over the terms Hindu/Hindi/Indian and how they’re NOT interchangeable that setting out with that was jarring to me. Previous Post A little salt, a little fat, a lot of bliss!